Though more than 80% of its population follows some form of Hinduism, India is officially a secular nation. In northern India the multicultural past is perhaps most evident, with ancient (and often still used) Mughul mosques and shrines around each corner. One might be less confident of finding religious diversity in the country's south, but that's exactly what the EarthSync folks found when they visited Nagore. A label based in the Indian city of Chennai, EarthSync visited Nagore to record the Laya Project album, a stirring tribute to the survivers of the 2004 tsunami. In the wake of the tragedy, the 500-year-old Muslim dargah (shrine) in Nagore fed and sheltered thousands of Hindu survivors. Why don't the media call more attention to such acts than instances of religious conflict? That will have to remain a subject for another day. 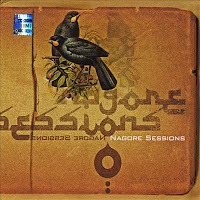 Today we celebrate the living, pulsing spirit of Sufi music of Nagore Sessions, an album that mixes the voices of traditional singers Abdul Ghani, Ajah Maideen, and Saburmaideen Babha Sabeer with Middle Eastern percussion, a touch of Tibetan brass, and modern production values. The seven tracks are all traditional Indian songs, with arrangements welcoming to Western ears while not straying too far from their roots. Don't expect Nusrat-style solo vocals; much of the singing is more along the lines of group chanting, as on this song about the greatness of God. In Sufism, so much is about climbing above the hard-line boundaries of religion to speak the common language of love. That's what these singers share with the world.